One of the most important aspects of building an efficient workspace is to ensure that your desk has adequate dimensions, is capable of holding everything you need, and is comfortable to work at. For office workers who are short on space, U-shaped desks are extremely popular because they give the individual considerable desk space without occupying too much of an office. Best of all U-shaped desks can also be custom designed or modified to more effectively fit in your workspace. More specifically, U-shaped desks design concepts can be constructed so that the desk’s dimensions coordinate perfectly with the layout of your work room or office. There are a number of other benefits to custom designing your U-shaped desk, too. For example, you can design your desk so that it has more filing columns, desk drawers, or a fiberglass cover. If you have a lot of paperwork or meet with people often, the abundance of workspace in a U-shaped desk will enable you to have adequate space for storage, complete tasks, and meet with others without feeling cluttered or overwhelmed. Another perk of custom building your own U-shaped office furniture is that it dramatically changes the aesthetics and layout of your workspace. Countless studies indicate that aesthetically pleasing, efficiently designed offices have a positive impact on workplace productivity and employee morale. Building a U-shaped desk to the exact specifications of your office space, then, is an excellent way to improve not only your productivity, but also to increase employee engagement. Like any proper desk, custom-made U-shaped desks come equipped with a number of storage possibilities. Of course, all of these drawers and cabinets are aimed at making your office more organized and functional. Depending on your needs and preferences, desks can be modified to hold paperwork, office supplies, and personal mementos. Customized U-shaped desks design can also account for your computer. Whether you are using a traditional desktop computer, or you are working on a tablet or slim laptop, there is a U-shaped desk design that is perfect for you. If you are thinking about adding a U-shaped desk to your office, make sure to take proper measurements of your workspace before ordering. Not only should you measure the dimensions of your office, but also measure the door frame width, window ledge height, and account for any odd corners, vents, or framing. 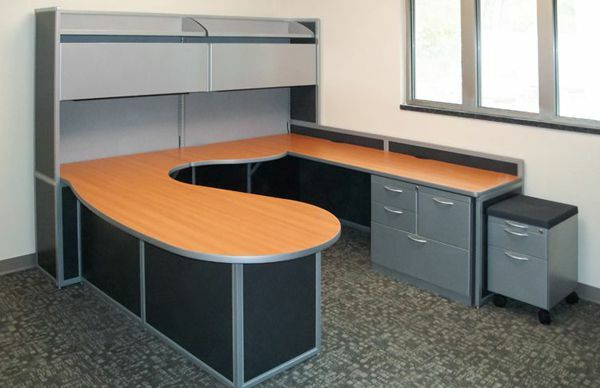 For questions on the customization of your u-shaped desks design, contact Interior Concepts at 800-678-5550.